Last week the seaside community of Qualicum Beach hosted a packed screening of Directly Affected, a film about pipeline opposition. Home to retirees from across Canada drawn by the mild climate, nice golf courses and sandy beaches, Qualicum is not exactly a hotbed of radical activism. But as I pulled out more and more rows of folding chairs, I realized: there were a lot of people showing up on a sunny Thursday evening to take in a show about climate change. Like a B.C. version of An Inconvenient Truth, Directly Affected explores how Kinder Morgan’s proposed pipeline and oil tanker expansion will affect the residents of Burnaby and Burrard Inlet. The film covers oil spills, the industry’s attacks on democracy and violations of Indigenous rights, all against the backdrop of a rapidly warming world. Perhaps that’s why turnout was so strong. Many British Columbians now realize we are on the front lines of what Al Gore and others tried to warn us about 10 years ago (and in the decades before). Warming oceans and intense weather have already inflicted staggering economic costs on B.C. Now, with record spring temperatures bringing another round of “once-in-a-century” floods, those losses are set to grow. It doesn’t matter if any of these individual disasters can be definitively linked to climate change. In fact, it doesn’t even matter if you believe in climate change. The frequency, intensity and destructive impacts of these events are trending upward just the same. From 1983-2008 catastrophic losses (primarily from floods) cost insurers and Canadian taxpayers an average of between $200 and $500 million per year. But in eight out of the last nine years those costs jumped over the billion dollar per year mark, often dramatically more. When the waters recede from their highest ever recorded levels on rivers across the B.C. Interior we’ll have another grim tally to record. As I wrote after last summer’s massive and costly wildfires — your climate is coming for you. As British Columbians sandbag their homes and ready livestock trailers for fire season, the Trudeau government is proposing to write a blank cheque to the former Enron executives behind the Kinder Morgan pipeline. It’s said the Texans want up to 10 billion dollars. That’s our money. We could help make it affordable for Canadians to get into electric cars as Norway has done. Instead our politicians want to give it to a Houston-based company — so they can crank up Canada’s emissions and further our dependence on heavy oil exports. How does one even begin to explain this? To his credit, film director Zack Embree takes a shot. He asks eminent energy economist Marc Jaccard what the consequences would be, from an emissions standpoint, of a large new bitumen export pipeline to the West Coast. For me Jaccard’s response was the most interesting part of the movie. The SFU professor (whose list of other credentials is embarrassingly long) quickly points out why it’s the wrong question to ask: Any proponent or government cheerleader can defend a single emission source by saying it won’t be the one that flips the lifeboat. That’s because the impacts, by definition, are spread out across the planet. But politicians are quick to point to revenue estimates or job numbers — all of which would accrue within our own borders. After all, that’s where their voters live. When the flood waters rise, the same thought experiment happens in reverse. The damage is inflicted on Grand Forks, B.C. or Fredericton New Brunswick. The culprit? Well, we call it an act of God. It doesn’t seem to matter if it’s the second, third or fifth “one-in-a-hundred year flood” to occur in the last two decades. We can’t bring ourselves to blame companies like Kinder Morgan, whose business model depends on the breakdown we’re witnessing. In fact we can’t even seem to talk about it at all. 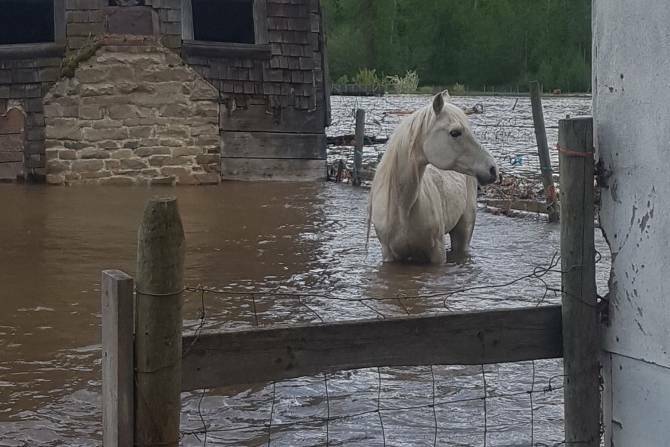 Grand Forks resident Brad Siemens told Global News this horse likely did not survive the flood. Photo by Brad Siemens (Global BC). Our climate is teetering toward failure. At the same time, so is the ability of our political system to respond. Trudeau’s cabinet, like others before, seems incapable of acknowledging the severity of the problem or Canada’s role in bringing it about. To do so would disrupt business as usual — and the short-term political sugar hit that comes with approving pipelines. This pattern makes it nearly impossible to ask the question Marc Jaccard really wants us to ask: When will Canada’s leaders take action commensurate to the problem we are facing? Because Mr. Trudeau, Canada is not back. Not even close. We are the 38th largest country in the world by population, yet only eight others have put as much carbon into the atmosphere as we have. Within that heavy hitters’ club, we’re second only to the U.S in per-capita emissions. Not because we drive to pipeline protests or eat avocados in the winter — our emissions are high because we allow oil companies to pump raw crude at the maximum rate with the minimum royalties — then sell it to refineries across the border. Trudeau wants to use our tax dollars to expand that model. All while trotting out meaningless tripe like “the environment and the economy go hand in hand”. There is another way. Formerly oil-dependent Norway has already started its post carbon transition. Electric and hybrid vehicles took 39 per cent of the market share last year and the government has set 2025 as the date to eliminate all gas powered vehicles. The difference? Its government controls the oil industry. The opposite appears to have happened in Ottawa. You would think Liberal MPs representing the greenest province in Canada would be putting up at least a show of resistance to what will turn out to be a catastrophic miscalculation for the Liberal brand in B.C. Yet, like zombies, they numbly pledge allegiance to a global industry whose actions are literally destroying our homes. When the scale of that betrayal finally sinks in, the political backlash will be immense. Last week 270 people in a small, straitlaced B.C. town took the time to watch a film about the local face of this democratic, economic and ecological crisis. At the end of that film, 208 of them signed a petition asking our government NOT to bail out Kinder Morgan. Their views mirror national polling averages which show the vast majority of Canadians, regardless of their muddle of feelings about pipelines, know one thing very clearly: they don’t want their tax dollars bailing out this Texas company. The Trudeau government has two weeks to come to its senses. Norway is still drilling and starting new drills.. They can afford to go green a little.. The horse in the photo, is s/he safe? Please let me know if s/he needs a home. No tax payers dollars to K.M. The Kinder Morgan pipeline is not in Canada’s national interest, & I absolutely do NOT want a penny of my tax dollars to support it. Please come to your senses Trudeau & take courage to stand up to the oil companies & demand change towards new technologies for carbon free energy sources..before it is too late!! Partner with them (like Norway – ownership) for a win win ..don’t take no for an answer!! You are in the drivers seat as prime minister of our beautiful country Canada!! Our lives & our children’s lives depend on it!! I’m sorry I voted for the liberals. A sad state of affairs w hen our inviornment seems to have no value. Stand strong BC. Don’t give in to the grand oil companies. Trudeau you are a weak minded individual. Wake up. We all live on a fragile earth. Protect what w e have left . If we look at the amount of snow fall this winter we can understand why flooding was so high. Google bc road snow and you will see images of 15 feet walls of snow around roads that have no snow around them now. The sun melted that large amount of snow over spring and caused flooding. Now high snow load is not the planet warming. I don’t know why I am arguing this because I am 100 percent behind electric cars. But our jobs and economy are very important as well. Let’s find a balance. Driving through the other week past Grand Forks one can see the huge amount of clear cut logging that has gone on over the past few years.All the water melting normal would be slowed down by the forest.If we deplete our forests of course the run off is quick and devastating. Justin, your father believed in every Canadians right to enjoy our wilderness environment. I believe you once said something similar. Don’t sell out. Please stand up..our Canadian wild is at risk..your children will miss out on that right as will future generations to come. Stand up make us proud..please. B.C. is flooding as the major fire season has already started in May (as of this week). Temperatures on the west coast are 20 degrees above normal for a majority of the month, in so-called spring. The nightly news is starting to pick up on this. Finally. It’s time for our leaders to wake up. We are in a very different world, and there isn’t time to mess around. Your dollars won’t be worth much when we can’t grow food anymore, and that time is getting pretty darn close. This is so sad. The entire oil industry, much like the tobacco and pharmaceutical industries, is entrenched and unwilling to let go. This industry wants to keep burning fossil fuels because this is how they profit. If we stop burning fossil fuels, then they lose money. It’s as simple as that. We all know that climate change is caused by humans burning excessive amounts of fossil fuels. The Earth actually receives more energy from one hour of sunlight than is consumed in one year by the entire planet. But we still burn fossil fuels because our governments are controlled by the oil industry and their cronies. my tax dollars to bailing it out at all!! They’re still drilling oil wells because they’re in the transition stage.